BACKGROUND: According to the recent report by the Ministry of Statistics in India, number of elderly accounts for 8.6% of the country's population. Aging causes biological as well as psychological changes. Decline in cognitive functions is one of the normative changes of aging; however, this may impact both physical and mental health of an individual. Quality of Life (QoL) is one of the prime features of successful aging. Hence, this study was undertaken to correlate the level of cognition and QoL in older adults. METHODOLOGY: One twenty-nine males and females of age 60–75 with or without cognitive impairment were selected using convenience sampling, those who could not read Hindi, who had any unstable medical condition, whose vision could not be corrected to normal level, and those with impaired speech were excluded from the study. Montreal cognitive assessment (MoCA) was administered to assess the cognitive level. QoL was assessed by QoL-Alzheimer's disease (AD) scale. RESULTS: Result indicated that there is a moderate positive correlation between MoCA and QoL-AD with r = 0.465 and P < 0.05. CONCLUSION: The study concludes that the level of cognition and QoL of older adults are moderately in positive correlation with each other. Population aging is a global phenomenon. Due to economic well-being, better healthcare system, good medicines, etc., there is a substantial reduction in mortality in the society. These factors together have resulted in increasing number of elderly persons in the population. This phenomenon, called population aging, is a dynamic phenomenon worldwide. A report released by the Ministry of Statistics in India reads as, the number of Indians over the age of 60 has hit an all-time high, accounting for 8.6 percent of the country's 121-crore population, according to official figures in the year 2011. Moreover, this number will rise each year. Aging of the individual may be viewed as the final stage of human development and is part of a continual process of change. As the people age, they change in myriad of ways – both biological and psychological. Biological changes also include changes in the cognitive functions. Normative changes in cognition have important effects on aging adults. Lower levels of cognitive functioning may cause later disability and death. Cognitive decline not only predicts later well-being, disability, and the use of healthcare but also affects the activities of daily living (ADL) of an individual. This may have an impact on quality of life (QoL) too. Mograbi et al. explain that executive functions play an important role in performing everyday tasks such as preparing meals, paying bills, taking medications, organizing, and planning the daily routine and appointments. Although there are several studies which explored the relationship between cognitive level and QoL, however, there are few studies done in developing middle-income countries. QoL is one of the prime features of successful aging. Hence, there is a need to study the cognitive abilities in the context of QoL and to understand the impact of cognitive decline on QoL in older adults. It is a correlational study for which the ethics approval was obtained from the Institutional Ethics Committee of the institutes from where the study was conducted. The study was conducted among community-dwelling older adults in Ahmedabad. One twenty-nine older adults were selected from the population using convenience sampling. The sample size was calculated using the formula n = 4pq/E2, where P = 0.05, q = 0.95, and E = allowable error of 10% of P. The population was chosen from various old age homes, clubs operating for older adults, gardens, and community-dwelling older adults. The subjects were explained about the study, and informed written consent was obtained. Both males and females, who were 60–75 years old, with or without cognitive impairments, and willing to participate, were included in the study. Those who could not read Hindi, who had any unstable medical condition, whose vision could not be corrected to normal level and those with impaired speech were excluded from the study. They were then asked to complete a questionnaire which included information regarding demographic data and the following outcome measures. For all the subjects, cognition level was assessed with Hindi version of Montreal cognitive assessment (MoCA). MoCA is a precise, sensitive, and comprehensive tool to assess major cognitive domains such as visuoconstructional skills, language, memory, calculation ability, attention, abstraction, and orientation. The total score is 30. A score of 26 or more is considered normal. At a cut-off score of 26, MoCA has a sensitivity of 90% and specificity of 87%. QoL of subjects was assessed by the QoL-Alzheimer's disease (QoL-AD) questionnaire. QoL-AD is the explicit tool designed for older adults. The scale effectively distinguishes demented subjects from cognitively normal age-matched elderly. A recent study investigating the use of QoL-AD in older adults reported excellent reliability and validity. The reliability of QoL-AD for older adults ranges from 0.83 to 0.90. It assesses the QoL including physical health, energy, mood, memory, ability to do chores around the house, ability to do things for fun, self as a whole, etc. The total score of QoL-AD is 52. 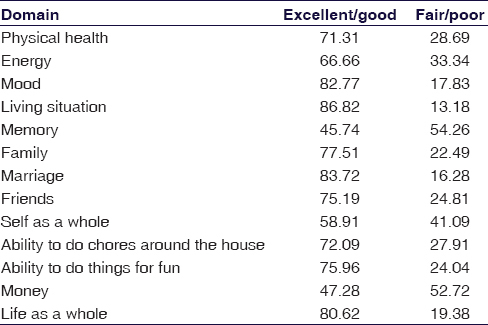 Each item is rated as poor, fair, good, or excellent with poor being 1 and excellent as 4. Since the individuals chosen may or may not have cognitive impairments, the QoL-AD was chosen as the outcome measure. All the participants completed the questionnaire. The obtained data were analyzed using IBM SPSS Statistics for Windows, Version 20.0. Armonk, NY. The level of significance was kept at 5%. The mean age of the participants was 68.44 ± 6.56 years. There were 56 (44%) females and 73 (56%) males. The most common group consisting 32% of them had education of at least 12 years, and 28% of them had education of 10 years. The education level of 4–5 years and 6–7 years was seen in 22.5% and 23.5% of the group, respectively. Least education was of 4 years. The cognitive impairment was found in 87% of total population assessed. [Table 1] shows the prevalence of domain-wise affection with MoCA and [Table 2] shows the prevalence of domain-wise scores of QoL-AD. [Table 3] shows the mean and median values of the outcome measures with and without memory component. [Table 4] shows a correlation between MoCA and QoL-AD with and without memory component using the Spearman's coefficient of correlation. [Table 5] shows the correlation between MoCA and QoL-AD social components using the Spearman's coefficient of correlation. The study consisted of 129 older adults aged 60–75 years. Cognition was assessed using MoCA and QoL was assessed using QoL-AD. The results indicate statistically significant moderate positive correlation between cognitive level and QoL. The findings of this study are similar to the findings of Lawton and Brody, where QoL-AD was correlated to mini-mental status examination (MMSE) and concluded that there is weak to moderate correlation (r = 0.24 to r = 0.59 with P < 0.05) between the two. The MMSE scores were also correlated to ADL score from physical and instrumental self-maintenance scale. The results indicated that lower MMSE scores were associated with greater impairment in ability to do ADL. Forte et al. also had similar findings and suggested that cognition and QoL are closely related to each other. He explained that cognition, a part of executive function, involves goal-directed actions and behavioral adaptability. Core executive functions such as ability to manipulate and update information held in working memory, and ability to shift between mental sets contribute to QoL. Kim, in 2016, studied older adults and correlated their physical function, cognitive functions, and QoL. He concluded that there is a higher correlation found between cognitive functions and QoL in contrast to physical functions and QoL. He explained that, though the healthy body is important for enhanced QoL, cognitive functions have greater influence on QoL in elderly. Chaves et al. in their study highlighted that individuals with cognitive decline presented lower QoL compared to those who did not have cognitive decline. Independency is what an individual necessitates at any point of time across the lifespan. Cognition plays a vital role to upkeep the independent lifestyle. Cognition also has an important role in performing ADL, as there are various activities which require reasoning, information processing, visuospatial abilities, and memory as well as communication skills. Decline in cognition may limit the ADL and thus lower the QoL. Glisky explains how cognitive functions may affect the QoL. She explains that many complex everyday tasks such as decision-making, problem-solving, and the planning of goal-directed behaviors require attention, recall, integration, and reorganization of information. When young adults perform the complex tasks, different areas get activated compared to older adults, especially within prefrontal cortex, indicating younger and older adults perform these tasks differently. She also adds that, not all elders go through the equal cognitive decline. Some may be able to retain their cognitive functions until their 70s or 80s. However, these high-functioning older adults show increased activation of their brain areas compared to younger adults. These findings suggest the compensatory mechanism adapted by aging brain. It also suggests that timely cognition training may help retain the cognitive function in older adults. In this study, QoL was evaluated with QoL-AD, though the participants, prior the study, were not diagnosed with AD. Andrew et al. in their research used QoL-AD to evaluate QoL in older adults. He explained that there is a faint demarcation between the normative cognitive functioning to early cognitive impairment, and for the same reason, QoL of the older adults too can be evaluated using QoL-AD. Furthermore, the prevalence of cognitive impairment in this study population is 87% which justifies the use of QoL-AD as an appropriate outcome for the present study. In the present study, the most affected component in cognition is memory with 87.27% involvement. The most affected component in QoL-AD is also memory with 54.26%. This can be explained by changes that occur in hippocampus because of aging due to which older adults have difficulty in remembering and retrieval tasks. There is a significant weak positive correlation between MoCA and QoL-AD without the memory components as follows: this suggests that, though memory stays as an utmost important aspect for both QoL and cognitive abilities, other components of cognition too affect QoL during aging. However, the weak correlation can be explained as other components, such as ability to do chores at home or ability to do things for fun, are less affected. These tasks are learned through extensive practice and include a procedural memory which may be retained across the lifespan. In this study, MoCA and social component of QoL-AD show moderate positive correlation. Social component of QoL-AD includes family, marriage, and friends. Özge Saraç in his study explained that social functionality has an important role to play in QoL. Those elderly, who have good family relationship and friends, have better QoL. Thus, it is important that social functionality in elders is encouraged. In this study, education level of the participants was taken into consideration while assessing the cognitive function. About 68% of participants, who have education of <12 years, scored 1 extra point as per the guidelines of MoCA. In spite of that, the prevalence of cognitive impairment was 87%. It is established that greater cognitive decline is associated with lower education levels. Cognition depends on the cerebral capacity of an individual, and education plays an important role in it. With better education, individual is less prone to environmental risks such as inadequate nutrition, insufficient neuropsychomotor stimulation, or more revelation to hazardous living conditions. With less of above-mentioned risk factors in adult life, there may be lesser chances of cognitive decline later in life. Depression and physical functions were not assessed in the study, which is a limitation of the study. The authors would like to thank all those who helped and provided their valuable guidance for the execution of this study. The authors would also like to thank all the participants without whom this study would not have been possible. Elderly in India – Profile and Programmes. Government of India, Ministry of Statistics and Programme implementation; 2016. Available from: http://www.mospi.gov.in. [Last accessed on 2017 Jun 07]. Squires A, Hastings M. Rehabilitation of the Older Person, a Handbook for the Interdisciplinary Team. 3rd ed. Cheltenham, UK: Nelson Hornes; 2017. Douglas A, Liu L, Warren S, Hopper T. Cognitive assessments for older adults: Which ones are used by Canadian therapists and why. Can J Occup Ther 2007;74:370-81. Shtompel N. Home-Based, Self-Administered Dyadic Cognitive Training for Healthy Older Adults: Feasibility Study. FIU Electronic Theses and Dissertations. 2606; 2016. Available from: https://digitalcommons.fiu.edu/cgi/viewcontent.cgi?referer=https://www.google.com/&httpsredir=1&article=3749&context=etd, DOI: 10.25148/etd.FIDC000718. [Last accessed on 2017 Jun 07]. Laditka JN, Beard RL, Bryant LL, Fetterman D, Hunter R, Ivey S, et al. Promoting cognitive health: A formative research collaboration of the healthy aging research network. Gerontologist 2009;49 Suppl 1:S12-7. McGuire LC, Ford ES, Ajani UA. Cognitive functioning as a predictor of functional disability in later life. Am J Geriatr Psychiatry 2006;14:36-42. Okun MA, Stock WA. Correlates and components of subjective well-being among the elderly. J Appl Gerontol 1987;6:95-112. Mograbi DC, Faria Cde A, Fichman HC, Paradela EM, Lourenço RA. Relationship between activities of daily living and cognitive ability in a sample of older adults with heterogeneous educational level. Ann Indian Acad Neurol 2014;17:71-6. Bowling A. Aspirations for older age in the 21st century: What is successful aging? Int J Aging Hum Dev 2007;64:263-97. Khanal AB. Mahajan's Methods in Biostatistics for Medical Students and Research Workers. 8th ed. New Delhi, Delhi: Jaypee Brothers Medical Publishers; 2016. Larner AJ. Screening utility of the montreal cognitive assessment (MoCA): In place of – Or as well as – The MMSE? Int Psychogeriatr 2012;24:391-6. Nasreddine ZS, Phillips NA, Bédirian V, Charbonneau S, Whitehead V, Collin I, et al. The montreal cognitive assessment, moCA: A brief screening tool for mild cognitive impairment. J Am Geriatr Soc 2005;53:695-9. Ready RE, Ott BR. Quality of life measures for dementia. Health Qual Life Outcomes 2003;1:11. Logsdon RG, Gibbons LE, McCurry SM, Teri L. Assessing quality of life in older adults with cognitive impairment. Psychosom Med 2002;64:510-9. Forte R, Boreham CA, De Vito G, Pesce C. Health and quality of life perception in older adults: The joint role of cognitive efficiency and functional mobility. Int J Environ Res Public Health 2015;12:11328-44. Kim D. Correlation between physical function, cognitive function, and health-related quality of life in elderly persons. J Phys Ther Sci 2016;28:1844-8. Chaves AS, Santos AM, Filho NS. Maria Teresa Seabra Soares De Britto E Alves, Association between cognitive decline and the quality of life of hypertensive elderly individuals. Rev Bras Geriatr Gerontol 2015;18:545-56. Glisky EL. Changes in Cognitive Function in Human Aging. Brain Aging: Models, Methods, and Mechanisms. U.S. National Library of Medicine. Available from: https://www.ncbi.nlm.nih.gov/books/NBK3885/1970. [Last accessed on 2017 Jun 17]. Revell AJ, Caskie GI, Willis SL, Schaie KW. Factor structure and invariance of the quality of life in Alzheimer's disease (QoL-AD) scale. Exp Aging Res 2009;35:250-67. Saraçlı Ö, Akca AS, Atasoy N, Önder Ö, Şenormancı Ö, Kaygisız İ, et al. The relationship between quality of life and cognitive functions, anxiety and depression among hospitalized elderly patients. Clin Psychopharmacol Neurosci 2015;13:194-200.